Everyone is familiar with the sweet confections that you can make with pumpkin puree (pie, muffins, sweet breads etc.) but if you haven’t tried pumpkin mixed with savory spices then you are missing out. I remember finding this basic pumpkin soup recipe YEARS ago (we’re talking late 90’s) and I’ve been meaning to make it again ever since. This time I decided to add a few more spices (now that my pallet has been influenced by southern cuisine) and I added a few crunchy roasted pepitas (pumpkin seeds) for garnish and texture. This flavorful and easy pumpkin soup takes less than 30 minutes to make and is the perfect side to a grilled cheese sandwich! In a medium pot, cook the finely diced onions in 2 Tbsp of butter over medium heat until they are soft and translucent (about 5 minutes). Do not let the onions brown on the edges. If they begin to brown, lower the heat. Add the pumpkin puree, chicken stock, chili powder, nutmeg and cayenne powder. Stir well and heat through (about 10 minutes). Add freshly ground black pepper and salt to taste. When you are ready to eat, sprinkle 1 Tbsp of pepitas on top of each serving. There are many varieties of pepitas out there and you can usually buy them from bulk bins which means you can buy just 1/4 cup if you want. When I purchased mine I saw not only plain roasted but also raw or roasted with tamari (similar to soy sauce). If you can find a chili or southwest flavored pepitas, that would be amazing with this soup. Even better yet, if you carve pumpkins and roast your own seeds, try coating them in some chili powder and oil prior to roasting. YUM! I plan on eating this soup with a grilled brie sandwich which I calculated to cost just $1.03 (two slices of bread = $0.36, 1 oz. brie = $0.67). Grilled cheese sandwiches go great with soup and provide enough substance to round out the meal and make you feel satisfied. Even though I used an expensive cheese, the whole meal totals out to just $2.10. That’s what I’m talking about. I just made this for my kids and they loved it!! I added a about 8 oz more of the pumpkin and 2 TBS of flour to thicken it a little. We are planning on having it again next week but using it as the base for a mixed veggie, ham and potato soup. I think I’ll try this with pumpkin pie spice for extra depth. This soup is delicious! I am really surprised at how much of a kick the cayenne pepper gives it. This was super easy to make and filling. Thank you so much!! Thanks so much, this is super easy, fast and delicious! I added about 1/8-1/4 c diced cilantro. It adds a nice flavor and touch! I love your site! 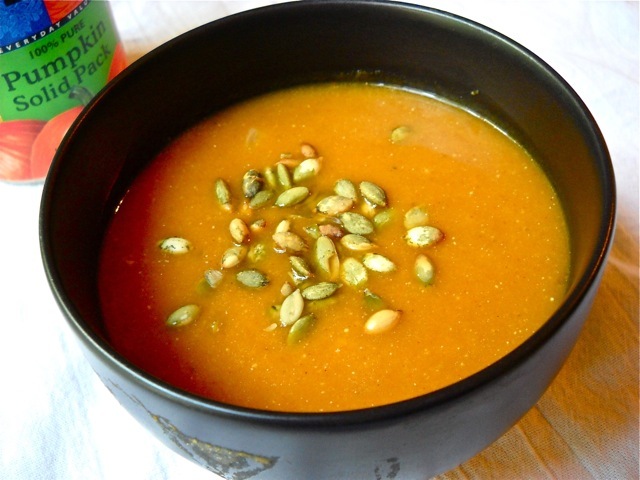 Unfortunately I’ve never has much luck with canned pumpkin in soup, and this was no exception – it was so bland I had to add garam masala and about 4T of lemon juice, then a dollop of yogurt on top to make it palatable. I guess I’m back to kabocha for fall soup bases. Thanks for your site and this great post. The pumpkin soup looks great! I do have one suggestion, though: show the cost of having to purchase *whole* items, not parts. I understand you probably can’t do this with spices, as people don’t usually buy 1 teaspoon of something at a time. In the pumpkin soup example, though, you can’t really buy half an onion, so your cost is not $0.42 but $0.84. While you can obviously use the other half of the onion, you *must* use it for the 1/2 onion’s cost to be relevant. Just a thought. Haha that’s exactly what we did with ours! Only we took it one step further and then spread it on toasted sourdough. Yum! I’m here because Mary Sue recommended your blog. I now have it in my favorites. And we’re working our way through your recipes, very tasty. you’re welcome! When I was eating it yesterday, I actually added a bit of my leftover coconut rice and they were amazing together! Thanks for this recipe. I wanted to make pumpkin soup but didn’t have a recipe. Now I do.